The Nike Golf – Pique Knit Polo Style 193581 is available in Adult Sizes: XS-4XL and comes in Black, Lake Blue, Navy, Orange Ice, Pro Red and White. The Pique Knit Polo features include a flat knit collar and cuffs, sporty forward shoulder seam, three-button placket and Nike Golf embossed buttons. Pearlized buttons are selected to complement the shirt color. The contrast Swoosh design trademark is embroidered on the left sleeve. Made of 6-ounce, 100% cotton. The Nike Golf Pique Knit Polo is available for purchase in the following colors: Black, Lake Blue, Navy, Orange Ice, Pro Red and White. 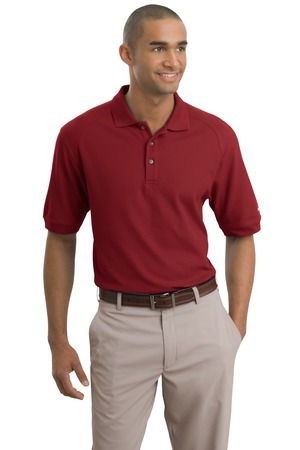 This polo is available in men’s sizes XS-4XL. Be the first to review “Nike Golf – Pique Knit Polo Style 193581” Click here to cancel reply.